In July, I was honored to present at the International Literacy Association conference and even more honored to find myself signing books at a table next to Adib Khorram. Though he tried his best to convince this coffee drinker that tea is the best beverage ever, we had a great conversation about books and writing. When I returned home, I delighted in the coincidence that my book group had selected Adib’s book for our November meeting. What are the odds? And to my further delight, I learned that Adib would be visiting the Seattle area on December 9, at 7 pm at 3rd Place Books, Seward Park (ink that in your calendars, Seattle friends!) Please read on to learn more about Adib and his debut novel, Darius the Great is Not Okay (Dial Books). My debut novel, DARIUS THE GREAT IS NOT OKAY (Dial Books), is not the first novel I ever wrote. In fact, the way I usually count, it’s the fifth. The other four novels (and one screenplay) are all trunked now. For the most part, I don’t think they’re particularly salvageable; not only from a craft standpoint, but also from an emotional standpoint. I’m at a different place in my life now, and so many of the things I’ve written, I can see they’ve come from what I’m going through at the time. There’s one exception, though, and that’s the book I wrote immediately before DARIUS. And it’s because of that book that I wrote DARIUS in the first place. It was March, 2015, and I had just written “The End” on the first draft of Novel Number Four. It was the most ambitious thing I’d ever written, and also the best: full of character beats, a strong plot, a great, unique hook. Granted, it was a first draft, so it was a mess, but the bones of the story were there. More than that, it felt like the kind of thing that could be a real book. I finished that draft on a Monday. I like to sit on my drafts after I finish them, so I can come at them with fresh eyes for revision. And then, the very next day, Publishers Weekly put out their Tuesday Rights Report. I scrolled down the site, excited to see what books were acquired, imagining seeing myself on that page one day. And then, halfway down the page, I stopped. Because one deal sounded exactly like what I’d just finished. I spent the next two days in a rage. Or a funk. Maybe a little of both. I couldn’t believe someone had written (and then queried and sold!) something that sounded so similar to what I was certain was going to be my debut. So after the rage and funk, I decided to dive right in to something new. Something just for me, something only I could write. Something I figured would never sell, but that I would have fun writing, because I was going to throw the rules out the window. At the time, I was visiting my father’s side of the family in Vancouver, British Columbia, for Nowruz—the Iranian New Year. And I was enjoying spending time with the family I only got to see once a year or so; feeling at once overwhelmed with love and devastated by the gulf that existed between me and my family, because of time and distance and language. DARIUS came out of those feelings. It was a departure from me: a character-driven, contemporary tale that had way too much of me in it. I was certain no one would ever want to read about a depressed, overweight, nerdy Iranian-American teenager who worked in a tea store. But I stuck with it. And when I finished a first draft, I kind of liked it. So I kept revising it. And I ended up querying it. And we ended up selling it. I avoid naming the book that was announced that was so similar to mine. But I wish it well. Because if it hadn’t been for that book, I never would have written DARIUS. And I’m very glad that I did. 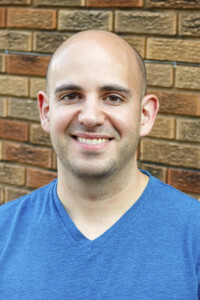 Adib Khorram is the author of DARIUS THE GREAT IS NOT OKAY. If he’s not writing (or at his day job as a graphic designer), you can probably find him trying to get his 100-yard Freestyle under a minute, learning to do a Lutz Jump, or steeping a cup of oolong. He lives in Kansas City, Missouri, where people don’t usually talk about themselves in the third person. You can find him on Twitter, Instagram, or on his website. I think quite a few writers have had the discomfort of seeing an author come out with a book that’s very similar to a current WIP. I love how Adib addresses this head-on and reveals how it led to a book that was truly meant to me. 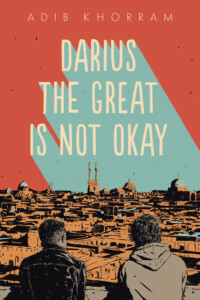 Looking forward to reading DARIUS THE GREAT IS NOT OKAY.